Costa del Sol; May 30th, 2018. With an investment of almost One Million euros, the Minister of Environment Isabel García Tejerina, together with the Mayoress of Marbella Angeles Muñoz are working on a project enhancement for the Marbella and San Pedro Alcántara clean up and beach improvements. The Ministry of Environment in Spain, Isabel García visited Marbella to discuss more details about the work that has been presented as a project for Marbella and San Pedro de Alcantara beaches enhancement plan. The meeting was held in the very known restaurant "Nuevo Reino" where its founder, Pepe Romero attended personally the minister. The minister was joined by the president of the Provincial Council, Elías Bendodo, the Mayoress of Marbella, Angeles Muñoz, the government delegate in Andalusia and the sub-delegate in Malaga, the president of the Commonwealth, Margarita del Cid and the councilor in charge of the beaches, Manuel Cardeña, in addition to municipal technicians, has shown her interested in the problem of that San Pedro beaches is currently facing. 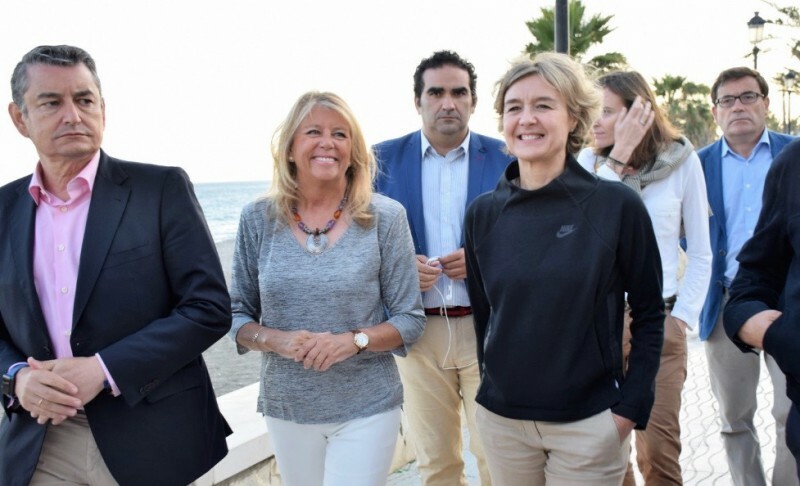 Isabel García announced during his visit to Marbella that in two days the project of stabilization of the coastal border in San Pedro Alcántara will be revealed to the public, an exposition that subsequently will initiate the process of bidding for the works. The person in charge of the central Government Angeles Muñoz has affirmed that "we are taking the last steps to begin the actions in 2019 in a surface of the coast of 3,5 kilometers". In regards to the stabilization plan of the Marbella strip that goes from the Nagüeles beach to the Port of La Bajadilla, it has advanced to the point that once the general quote has been approved "we are going to push forward the project in order to work on the surface of 2.5 kilometers ". "The commitment from the national Government with Marbella and its beaches is very clear and we are focused on enhancing the coastline of this city which is so important and that generates so much wealth," said Tijerina, who has stated the intention of "working towards the Marbella coast related to the environmental and tourism subjects ". On the other hand, it has been planned for this summer an investment from the Ministry of Environment of almost one million euros for this project in the municipality with a clear aim of improving this area to its best "after the problems that have suffered." Angeles Muñoz has ensured that the minister's announcements "These are great news for the city." "We really want to thank you for your time and visit in Marbella in a day we knew you were really busy even though you made time for us'', Mayoress also said "She promised me that she would come to the city once she had an opportunity to discuss the main projects that she's trying to propel from her work goals and what areas she was claiming''. The following people have assisted to the meeting, Government delegate in Andalusia; Antonio Sanz, the sub-delegate in Malaga; Miguel Briones, the Council President in Málaga; Elías Bendodo, President of Commonwealth for the Municipalities in Costa del Sol; Margarita del Cid, Second Mayor's lieutenant of San Pedro Alcántara; Rafael Piña, and Environment Councilors; Manuel Cardeña, Finance; Manuel Osorio.